The school year is in full swing with teachers back in their classrooms. Some folks might mistakenly believe that teaching is an easy job. Not me. Fifteen years ago, on my first morning as a substitute teacher, I vividly remember standing in front of a class of about 25 high school students at multi-academic levels waiting for my instruction. Over and over the school bell rang that stressful day signaling the next period and at least 20 new faces would fill a vacated desk. Some of the students looked bored, some seemed intent on learning, while others were openly rebellious. Thus began my year as a substitute middle/high school teacher. It’s necessary to qualify that I am not a teacher by training. Rather I was an unemployed journalist who had a rose-tinted vision of imparting knowledge to young people. My idealism about changing the world was quickly diminished when after a few weeks of subbing my goal turned to that of survival. The truth is many substitutes never really get the chance to teach, since thankfully an absent teacher’s lesson plans include; a relevant movie, worksheet, or directions for a project already in progress. Seasoned educators know that subs are babysitters, just like veteran reporters know that recently graduated journalists are cubs. It’s a new substitute’s job to prove oneself, but that can be very difficult moving from school to school and classroom to classroom. For example, that first fall a particularly boisterous group of high school boys threatened to end my budding teaching career. While trying to take attendance, they proudly revealed that they had gotten rid of their last sub, “an elderly gentleman with purple hair” by flying handmade paper airplanes at him. The mischievous teens laughed in mocking delight as they encircled me, while I frantically maintained that they were to “take their seats.” Their loud taunting voices were suddenly silenced when their principal mysteriously appeared in the back of the room offering them two for one Saturday School if they continued to be disrespectful. Order immediately returned, because most high school students want to avoid punishment at all costs. Sadly, some parents enable their children to disregard school rules. This can become a teacher’s worst nightmare, when a student is empowered by the fact that they will have no consequences at home for acting up. In my short tenure, I observed innocent teachers threatened for something as simple as denying a disruptive student a hall pass or even occasionally being pelted with undeserved obscenities by an unruly youth. I withstood my own daily teaching tests pretty well, choosing to focus on the majority of obedient, compassionate and helpful students who could be found in every classroom. Although by early spring, it was the middle-school students who convinced me that I would have to end my career as a nomadic sub. Most of them didn’t seem to understand consequences like the high-school students did. Therefore, pandemonium broke out once when I was placed in a classroom with 15 middle-schoolers, 15 sewing machines, and a missing bobbin. My young charges began to angrily blame each other for the missing bobbin, while imploring me to mediate the situation. 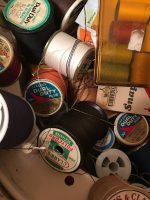 In exasperation, I said, “What is a bobbin?” My admission of ignorance drew a look of disdain from the teens and tweens who showed me the small sewing machine part wrapped with colored thread. 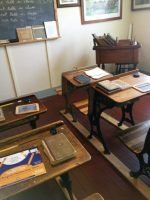 After settling the dispute, I leaned against the blackboard and gazed heavenward, silently asking, “God, what have I done to deserve this?” My answer came in the lessons gleaned during that memorable year. Even though my brief teaching career ended shortly after the “sewing machine” incident, I learned that the life of a caring teacher is anything but easy or carefree. Their evenings are filled with grading papers, creating lessons, and doing all the things they can’t get done in a classroom filled with boisterous kids. 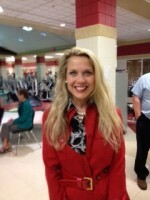 This experience also prepared me for life as a school administrator’s wife, since I married one the following summer. 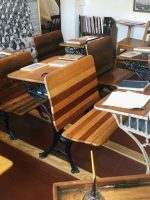 This entry was posted in On the Road Less Traveled and tagged classroom, cub reporters, journalists, lessons, school, sewing, sewing machines, students, substitute teachers, teachers by Christina Ryan Claypool. Bookmark the permalink.